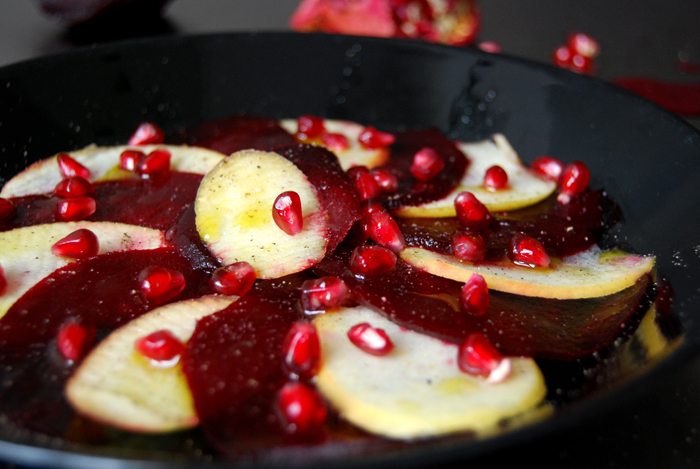 A quick carpaccio in bright red with cooked beetroot, apple and pomegranate to welcome a special guest! My mother will be at my home (and in my kitchen) over the next few days. I’m sure we’ll be out a lot but I really hope we’ll find some time to cook together which I enjoy a lot! I’m a big fan of vegetarian carpaccio. It allows you to combine different flavours in a very pure, quick to make and beautiful way. All you have to do is slice a vegetable or fruit very thinly, arrange it and top with a simple dressing. 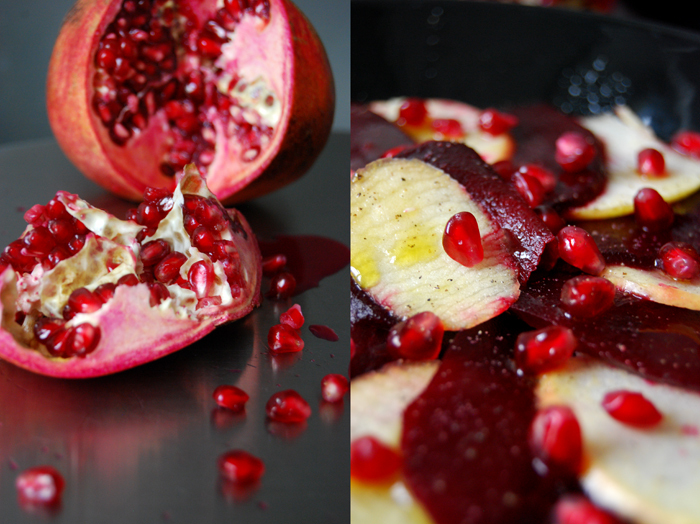 My red carpaccio is based on the strong, earthy-sweet taste of cooked beetroot which combines perfectly with the sweetness of the apple and pomegranate. I cooked the roots in a bigger batch – as I do every week – in salty water with two bay leaves for 50 minutes (depending on their size they might need shorter but mine were big). 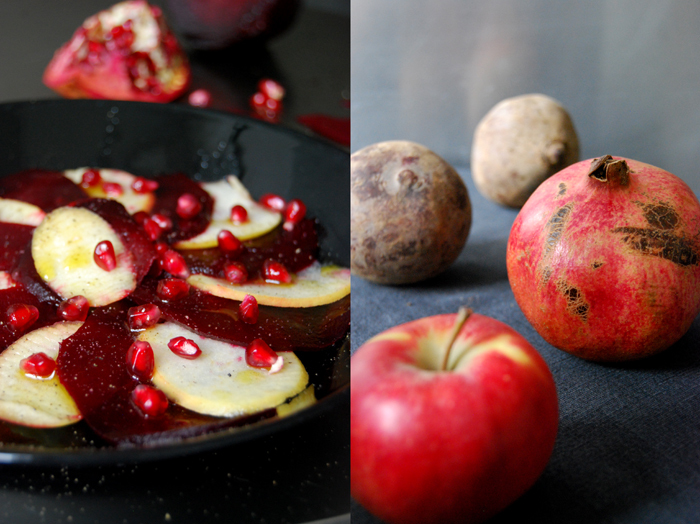 For my carpaccio for 2 I need 1 root cut thinly with a slicer, 1 sweet apple prepared in the same way and the seeds of 1/3 of a pomegranate. I drizzle my current favourite lunchtime dressing on top, 3 tablespoons of olive oil mixed with 2 tablespoons of white Balasamico and season it with salt and pepper. It’s a great lunch, as pretty as it is tasty! 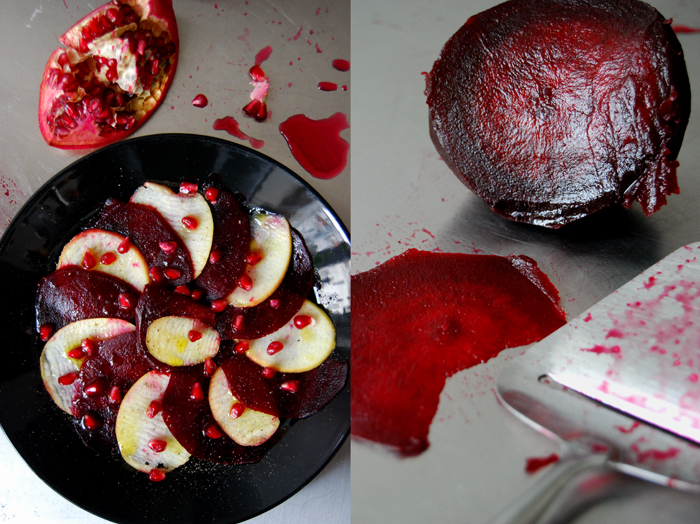 Thank you Mila, your blog looks great too and your winter beet salad sounds delicious! I like your blue cheese idea, I will try it. I always cook the roots in water, I don’t use a microwave, I love their sweetness when they are cooked. In winter, I always have a few cooked ones in my fridge.